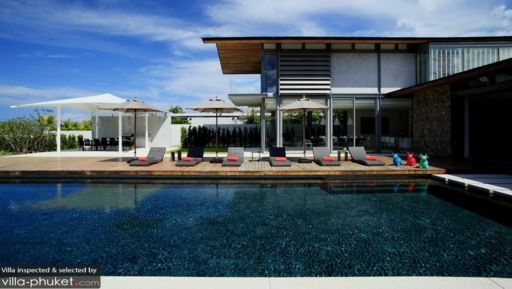 Villa Cielo is found on the untainted and serene beach of Natai in Phuket, with six bedrooms ideal for larger groups of travelers. The villa is a swanky, contemporary property with elegant and chic design, crisp lines, and infusion of the great outdoors with the comfortable and cozy indoors. There is something for everyone at the villa with a media room fully-stocked with over 2000 movies that you can watch, indoor/outdoor dining options, an infinity pool, and a sun deck for sunbathing! Villa Cielo boasts of six, fully-furnished, and well-appointed bedrooms that are found around the swimming pool and garden, providing you direct access. The bedrooms are furnished with double beds or single beds for your comfort and a good night’s rest. The simple and minimal décor give the rooms a cozy and inviting ambiance. The bedrooms have en-suite bathrooms with bathtubs or walk-in showers. There are comfortable sofas, chairs, or lounge chairs in the bedrooms and some have televisions for entertainment. The stunning 25-metre swimming pool with an infinity-edge is the crowning glory of Villa Cielo as it overlooks the dazzling waters of the ocean that you can view nonstop while you lounge on the sun deck. 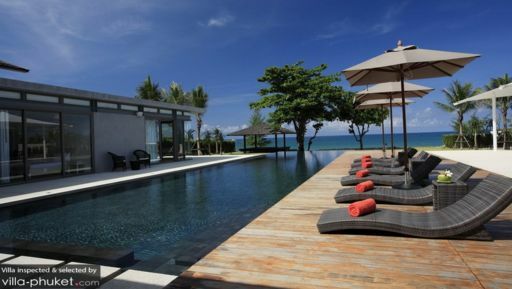 The stunning view is sure to put your mind at rest, as you chill in the pool’s crisp waters. There are parasols to shade you from the hot, tropical sun and don’t forget your sunblock as you sunbathe! A pathway over the waters leads to the main porch right in front of the living area. Towards the ocean, you will find a large sala which houses an outdoor lounge with an alfresco dining area, barbecue. The open-concept living area opens out directly to the swimming pool and looks out at the sprawling ocean in the distance for a remarkable view. The room is modern in design with white sofas, wood-paneled ceiling, and spot lights for a luxurious ambiance once the sun sets. 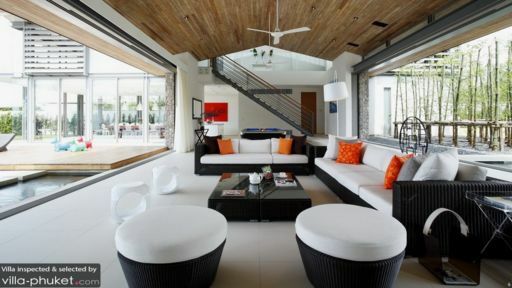 There are several sofas, chairs, and stools for sitting, and towards the back the living room opens out to a tropical garden with ponds and lush greenery. Besides the alfresco dining area, there is another more lavish indoor situation with a gorgeous 10-seater dining table with clear chairs. The entire room is encompassed within glass-walls for a sunroom kind of ambiance. So, you can enjoy your meals as you relish the view outdoors. The kitchen is fully-equipped and functional, ready for use, along with a breakfast bar and stools in an all-white layout. The media or family room is where you will find comfortable sofas, a view to die for, a pool table, and a Smart Media System with more than 2000 movie titles for you to enjoy! There is much to do around the villa, including kayaking. There is a football pitch as well, if you want to challenge you friends and family to a game. The friendly staff is also there to cater to your needs and ensure that your stay goes by smoothly. The villa remains clean and in perfect condition owing to the efforts of the kind staff. They will even serve a delicious, piping-hot breakfast each morning! Natai beach is a quiet and calm spot of sand and water where guests can relax and sunbathe, go kayaking, paddle-boarding, or exploring. Explore the land on foot or rent out cycles for a fun day out in the sun! The 6 days I spent staying at Ceilo Villa were absolutely amazing. The villa is superb, cleanliness and attention to detail is provided by the staff. Each one of them was so helpful, kind and great and I was almost quite sad to say goodbye to them at the end of our stay. They were wonderful at providing information about nearby activities and companies. Helped in telling us best places to visit for these activities and how far they were from our villa. The chef was superb in making the meals everyday and they were deliciously prepared. They were simply on point, attentive and helpful at every step of the vacation. Thanks to the staff for making it a memorable holiday! Beautiful villa, amazing location, wonderful staff. I recently stayed at Villa Cielo and Sava estates where we held my husbands 40th Birthday. I have to say, I've stayed at numerous villas around Thailand and Bali and this experience was one is the best I've ever had. Fabulous for families but also for a group of couples. The location is just simply amazing with white sands, amazing sun sets. The service was insanely good, with such intuitive planning & just amazing thoughtfulness. All members, from the Villa Manager (Jaeb), the Chef (PIA) and the other amazing helpers were fabulous. The actual event management for the day was flawless where the whole team helped in making sure all our guests were taken care of. I have to say, it was just brilliant. I was recommend this place to anyone who wants a special vacation with impeccable service and flawless arrangements. This is my first time in Thailand. The staff at Cielo made sure it wont be my last time! The helped with my every whim. The food that was cooked and baked was delicious and v well presented. The events and hospitality was top notch. Even when I asked for the ridiculous the staff tried their utmost to make it possible. I cannot recommend them enough! I hope to come back again next year. Hopefully the staff will have me! we have stayed there for 4 days, and everything is perfect. the staff is quite nice and make the whole villa very clean, and the food is the best thai food ever. and no need to go outside restaurant. our villa manager Apple is really nice we hope we can come here next year with our family. Thanks for making it a memorable holiday! Beautiful villa, amazing location, wonderful staff.. Since its opening late last year, we have already stayed there twice which sums up our view of Phuket and more importantly Villa Cielo! Highly exclusive, the villa's facilities catered to our family from our young children to the elderly (my mum) that the whole family was occupied throughout the day. The beach was pristine and importantly quiet, allowing us to spend quality time with the younger children, as they enjoy the sand the sea. Pampered throughout our stay by the excellent service in house, everything was taken care of. The Thai food prepared by the cook was comparable to any high-end Thai restaurant you would find in town. Highly recommend!